Men. They can be so hard to buy for. Each and every year, I spend countless hours searching for the perfect gift to buy each of the men in my life. My dad is the hardest to buy for. What do you buy the man who enjoys the simple things in life? This year, it will be the boyfriend and I’s first Christmas together. I simply cannot wait to wake up and present him with his gifts. Again, he is also difficult to buy for but hopefully, he will like what I’ve bought. 1. Whiskey Stones:: An ingenious product from homewetbar. My dad and I are both whiskey drinkers, he prefers his neat. The one problem? He hates it when the ice melts and dilutes the flavour. These clever whiskey stones will keep his whiskey chilled and undiluted. Genius. 2. YMC Knitwear:: Stylish, unique and durable, YMC is my boy’s favourite brand. With him walking to work each day, this cozy knit would keep him warm. It’s also the colour of his favourite football team, bonus. 3. Uniform Wares Watch:: I actually bought this for the boy’s birthday present. In my opinion, you can’t go wrong with a watch, it’s something every man will find useful. I love its simple, clean design. 4. Lambswool Scarf:: This is one for my brother. He’s four years older than me, in his thirties and likes practical presents. This lambswool scarf won’t date and will keep him snug for years to come. 5. Lomography Sardina Camera:: One thing my boyfriend and I share is a love of photography. This year, he’s bought so many cameras; from Polaroid cameras to my Diana F+. This is another toy camera to add to the list! 6. Le Creuset Mug:: Well, who doesn’t love their own brew mug? 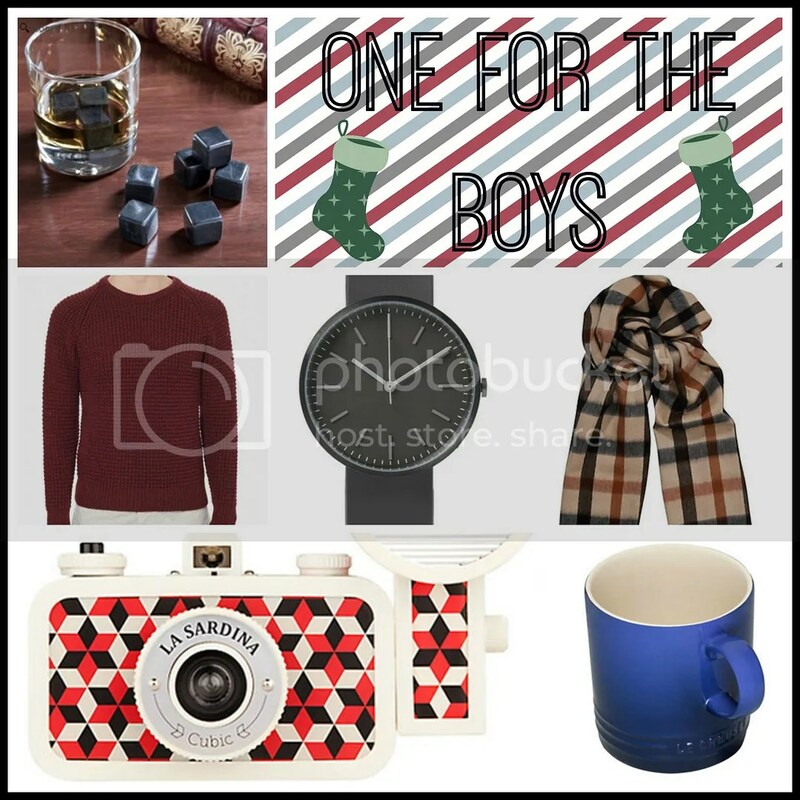 What have you bought the men in your life this year? Enjoyed this? Did you see my Christmas lustings?